Rogers is an expert on the impact of technology in the marketplace and on day-to-day life. He is well known as MSNBC's "The Practical Futurist," and for making technical concepts easily understood. In addition to his work with The New York Times Company and MSNBC, Rogers is a dynamic speaker, consultant and facilitator. In this interview, he shares his experiences and views on innovation, within and beyond news organizations. His responses are candid and compelling. Jo Grogan (JG): In light of today's global economic climate, what can and should be the role of innovation? 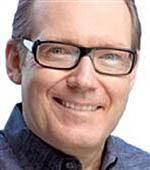 Michael Rogers: I think organizations need a two-part strategy. One part: spread the innovation message throughout the organization and look for new ideas everywhere. The second: one must have some separate resources set aside to advance innovative ideas, such as a research and development group (even if that's one person). Operational units can come up with great ideas, but rarely have the bandwidth to see them through. JG: What is the most difficult problem you and your team have solved? Were there any surprises along the way? Michael Rogers: In the online news world, it was convincing newspapers and magazines that they should publish their stories on the Web when they were done, and not wait for the paper edition. It took external forces to make that transition—fear that a competing news company would break a scoop before press time. But once executives saw that early publication on the Web didn't seem to cause any problems, it became more or less the standard. JG: What is the most exciting innovation you've been involved in developing? What factors made or make it so exciting? Michael Rogers: it has been learning how to integrate video into news organizations—which we're still learning. We found that in fact much of what the traditional television industry knew about video wasn't actually that applicable in the online environment, so it was an opportunity to rethink the medium from the start. Michael Rogers: I have always been addicted to outliners—even the simple outline function in Word. Programs like Microsoft's One Note take that many steps further, and while they may be a bit difficult to learn, they're really worthwhile. JG: What innovation methodologies, theories, and training do you use, or recommend to others (e.g., Six Sigma Edward DeBono)? Michael Rogers: The ILO Institute has a report on innovation. When I first read it, I thought somebody had been reading my diary. It's a very concise overview of the issues that innovators run into in large organizations. JG: In your experience with companies, how are outside consultants used in the innovation process? How do they integrate and work with in-house teams? You sometimes cite an example of a young professional on your staff who outsourced a quick-response problem to a programmer in another country. Michael Rogers: I've both used and been a consultant. I think consultants are valuable to bring in new points of view, to give a fresh analysis of the existing systems, to spark new thinking. But innovation really needs to be crafted within the organization, or it just won't stick. I just finished working with a bank that was updating their last strategic planning document, which wasn't working well. The first tip-off: in-house, they still referred to it as "the consultant's plan." JG: When teams are working on a problem, or developing a product and hit a barrier beyond which they cannot move, what do you recommend? MIchael Rogers: Depends on the barrier—but it's crucial to have someone high up in the organization who is covering for the innovators, providing extra resources, and breaking institutional log-jams, since these are very often the barriers that are the most troublesome. JG: What are some of the obstacles that prevent design teams from creating innovative products? Michael Rogers: I haven't done much of this yet, because I find the tools still too awkward, although they can be useful for ongoing projects. I still find the best initial innovation comes from having everyone in the same physical space, with a big, big whiteboard and lots of markers!